Kew Laddie. Owned by Miss L C Johnstone (Chicago) Photo: The Ladies Field, (June 1903), courtesy of The Harrison Weir Collection. 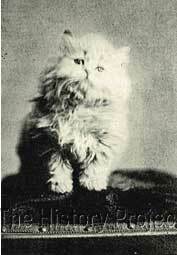 Kew Laddie was one of the very first Cream Persians bred in England to make a significant impact on the Persian show scene in the United States. 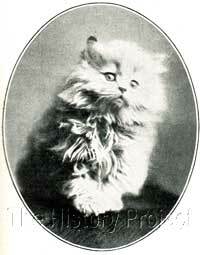 "Champion Kew Laddie…is a deep cream-colored cat, the rich Jersey cream that only real country-folks ever see. 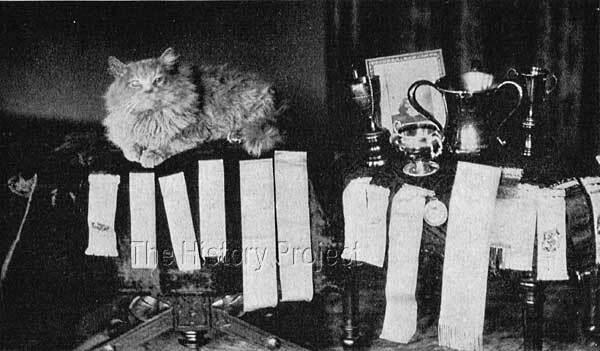 He came to America when only nine months old, and at ten months of age he entered the show given by the Beresford Club, and won first prize in a class of seven. Each year he has gone on winning, until his prizes are innumerable. 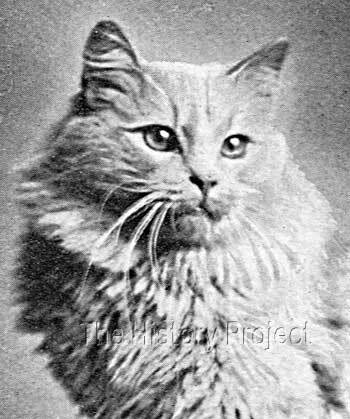 He is one of the finest cats in America, and his sunny disposition endears him to everyone. He has never been known to growl, scratch, or bite, and any one may handle him with safety; he is just as willing to lie on his back as to be 'right side up with care'4. Ch.Kewlocke (Black Smoke) Born Aug 16, 1904, out of the very lovely smoke queen, 'Lockehaven Lucy Claire'. 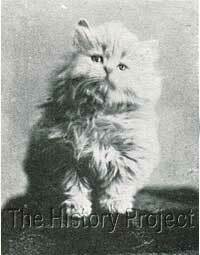 Bred by Mrs. Clinton Locke and owed by Mrs. G.B.Brayton. 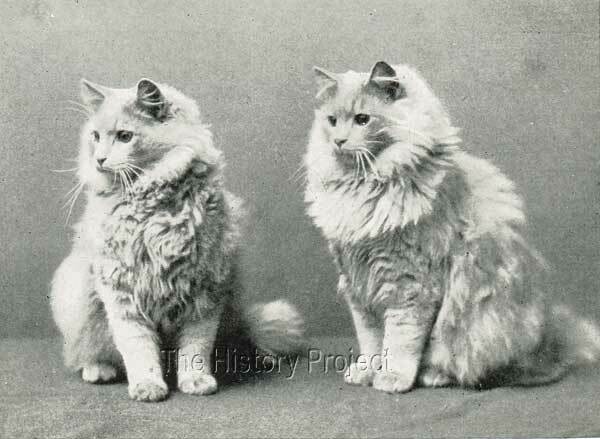 Ch.Melrose Buster Bright (Red) Born May 1st, 1904, out of Lady Isabelle Torrington, bred by Mrs A.H.Potter and owned by Mrs. M.M.Mitchell. 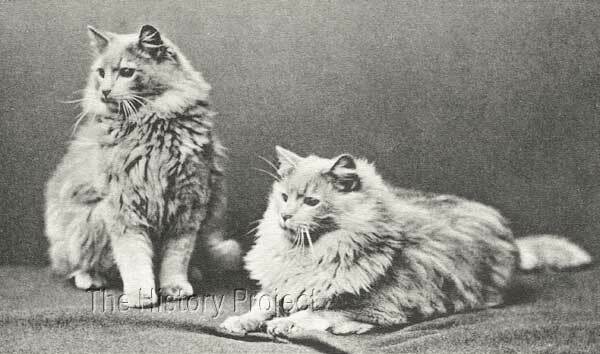 Ch.Kewette (Red) aka 'Miss Kewette'	 Born April 26th, 1904, out of Queen Alexandra Torrington, bred by Mrs. P.A.Wattles, and owned by Mrs. Howard Alton. Jessica Kew (Cream) Bred by Mrs Clinton Locke, out of Lockehaven Daffodil. From the library of Charlotte Tamblyn Tufts. Image courtesy of The Harrison Weir Collection. Photo: Cropped close-up from The Ladies Field June 1903. 4. Capt.Kidd Jr. and Sinbad the Sailor (1908) by Caro Senour. 6. Photos and quotations as per sources quoted.